Our popular L-Two jean is a standard rise leg length with a slim straight leg profile. 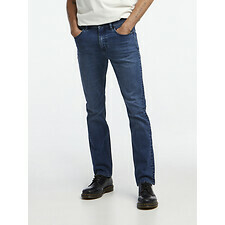 Designed in a comfort stretch fabric with a regular leg length it features in a modern dark blue wash. denim. I wear these jeans just about every chance I get, they're super comfortable yet durable. I ride my motorcycle with them and block block tons of wind! Great product overall!